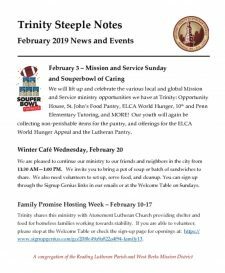 Steeple Notes Weekly is our newsletter that lets you stay connected to upcoming Trinity events and ministries. Our online edition is enriched with active links to related resources. 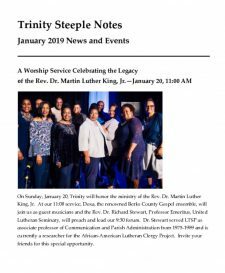 Steeple Notes is emailed every month to members and friends of Trinity and recent newsletters are available via the links below. 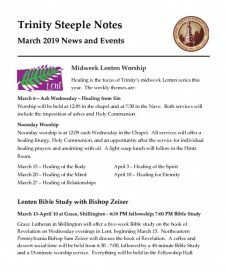 To join our Steeple Notes Weekly mailing list please email our Parish Secretary, Rachel Gambone, using the contact form below to opt in. Recent Issues can be found below. 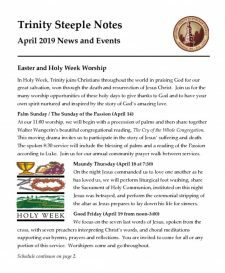 Our online edition of Steeple Notes is best viewed with the free Adobe PDF Reader. You can download the most recent version by clicking on the icon below.